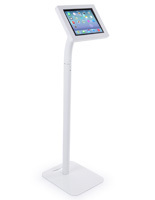 Looking for an interactive display that any customer or visitor can use? 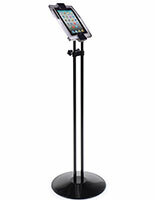 These height adjustable iPad stands have a changeable stature for meeting the needs of any user! 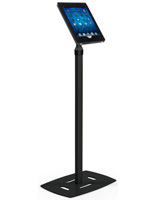 Each is made of strong steel or aluminum for safely gripping tablets even in high traffic areas. 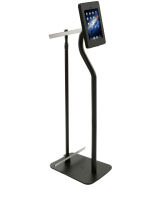 All height adjustable iPad stands, or alterable tablet holders, also feature a rotating bracket that allows the device to be viewed in either a portrait or landscape orientation. Depending on the model, they can hold generation 1, 2, 3, 4, Mini and Air Apple® touchscreens and Galaxy screens measuring 10” or less. Floor standing kiosks like these are great for hotels, restaurants, retail stores and many other public venues. 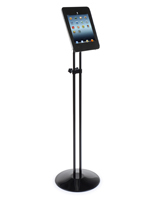 However, each of the height adjustable iPad stands has its own features that make them suited for different environments. 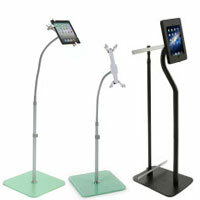 What options are available with these changeable tablet holders? 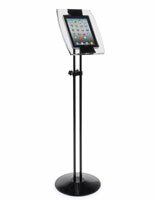 A height adjustable iPad stand can have a flexible neck for easily aiming a touchscreen in any direction. 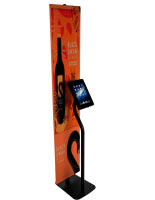 While these kiosks with a gooseneck design are easy to bend, they stay rigid during use. 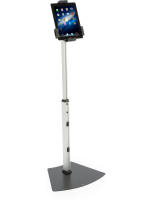 In addition, these models have a telescoping pole that allows them more freedom of movement. 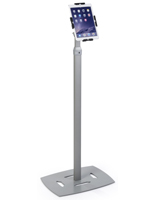 While all adjustable iPad stands feature a rotating bracket for both portrait and landscape displays, some have more degrees of freedom. For further accommodation of users with different statures, come enclosures are able to tilt up and down, sometimes up to 180°. 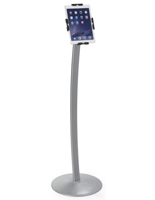 Additionally, some mounts have the ability to swivel up to 360°, which means customers can use the touchscreen holder from any angle. 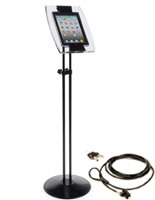 Adjustable iPad stands with a locking case are an ideal option for keeping devices safe from theft. These models use an included key to secure valuable electronics. 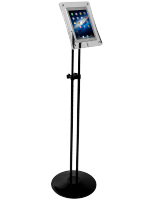 Each of the floor standing fixtures features a sturdy steel or aluminum frame to prevent break-ins. Some units have two locks for extra security. 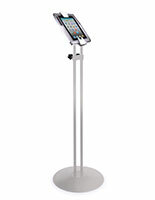 iPad stands with a banner pole allow businesses to showcase signage along with their interactive display. 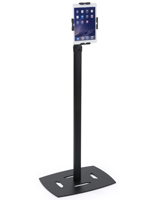 These floor standing kiosks can showcase a 15” wide graphic behind the touchscreen case for bringing in passersby or giving users additional information. Eye-catching fixtures like these are great for trade shows because they can attract visitors with a banner and then showcase business information with slideshows, videos and apps. They can come with an included blank or custom banner and an optional clip-on literature shelf. 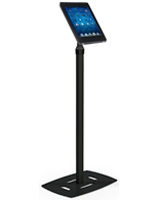 Floor stands like these can feature a clamping design that makes them compatible with more than just Apple® products. Enclosures with a (4) clamp layout can grip any device with a 10” screen or less. This allows them to support Android electronics like the Samsung Galaxy Tabs or Google Nexus computers. 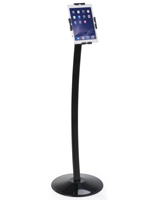 With a variety of features to choose from, these stands are ideal for any business or event. 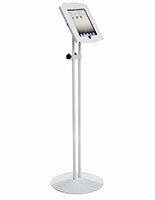 Restaurants can use these fixtures for interactive menus and waiting lists. Companies can bring them to trade shows to publicize their products and services with apps while dispensing brochures. 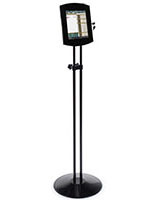 Retail stores can make use of the mounts with digital catalogs and advertisements or they can be set up as checkout stands for use by customers or employees. With the amount of available apps, there is no limit to the uses of these merchandisers and advertisers!